Love it!! We really do always end up in your kitchen and are only forced into the living room when someone gets tired of standing.. hilarious! Good idea, lady! 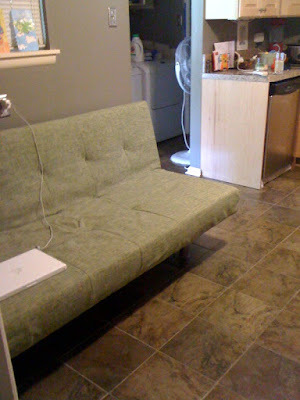 Couch in kitchen = fantastic idea. Did this when we lived in the basement suite of friends, and it got used like CRAZY. 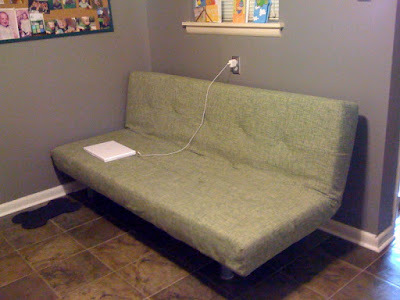 Plus it was a super tacky (think bright orange) 'conversation' couch from the 70's (maybe 60s?) so it rocked the casbah. neat idea. i could see how that would come in handy. that's a great idea! and lucky you=big kitchen. Totallly envious of the couch and the space you have it in. Le sigh. I would nap there.